We had the opportunity to facilitate a review for a pair of Lugz Empire WR Mens Black/Camo Boots. In my home, we are all huge fans of Lugz Footwear. They are always quality made, stylish footwear. My son that is the hardest on his footwear still has a pair of Lugz boots we gifted him last year. They are still in really good condition and he wears them frequently. My oldest son is also hard on his footwear. He is constantly on his feet, doing odd jobs to earn money, church functions, working on his bike, helping his dad amongst other activities. 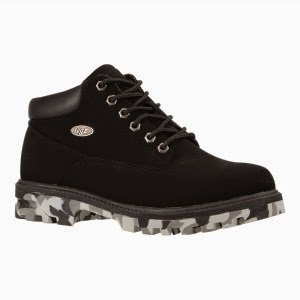 When I received the Lugz Empire WR Mens Black/Camo Boots, I knew they were perfect for my son and he would love them. The Lugz Empire WR Men's Shoes are water resistant and slip resistant. They have a memory foam and the tongue and collar are padded. They also feature Flexa-Stride Memory Foam Sock liner and ASTM-F1677 Mark11 tested slip resistant rubber sole. Up until very recently the weather in our part of the world was wet, icy and cold. My son is impressed that his shoes have withstood the weather and still look great. He is very picky about his attire, so he likes that the boots are dressier than a work boot but rugged enough to get his outside jobs done without any problems. He likes the memory foam inside that keep his feet comfortable even after hours of wear. Also important to him is that the Lugz shoes can be easily cleaned, even after being out in the mud he takes a cloth and cleans them up and their as good as new. We all like that the Lugz brand are quality made yet stylish and trendy. You don't have to give up one to get the other. Lugz has always been an innovator and leader in footwear, they first made a name for themselves in October of 1993, bringing their first line of boots to the market. The initial product consisted of two types of boots, a quilted vest and a pair of jeans. Soon after Lugz was endorsed by key players from the world of hip hop and has continued to do so over the years. One such collaboration was with Brian "Baby" Williams aka "Birdman" leading to his own series of boots and sneakers. In 2006, Orange County Choppers signed on to endorse the Lugz brand. The premier builders of motorcycles were already wearing Lugz, so it was a natural fit. Lugz shot on to the mixed Martial Arts scene in the fall of 2008, signing on their first two MMA Fighters, Lyoto Machida and Houston Alexander as endorsers. Machida captured the title of UFC Light Heavyweight Champion as he represented Lugz. MMA was becoming the fastest growing sport entertainment platform with an increasingly growing fan base. Lugz was excited to be a part of this growing trend and later signed Quinton “Rampage” Jackson. In 2010 Cain Velasquez became the newest endorser of Lugz. From inception, From its inception, Lugz footwear has been an innovator in the footwear market from its signature styles, to creating trendsetting styles beyond boots and has added casual shoes and athletics to the mix for the Lugz men, Lugz women and Lugz kids lines. Today, May 4th and tomorrow, May 5th you can take advantage of 35% off these awesome shoes! Just visit Lugz.com, no coupon is needed to receive this great deal! They are celebrating Cinco De Mayo! You can connect with Lugz via Facebook , @LugzLifestyle , Pinterest . I love the Lugs brand. I know that they last. I would love to win these for my husband. I really enjoy Lugs. I am trying to win for my husband but I would be nervous that the size I pick wouldn't fit if I did win. My husband normally has to try on shoes in sizes 11-13 before he finds the perfect pair. I am never sure of his actual size. These are awesome boots! I really like the way they are made, and the colors. He will be proud to wear these! These are really nice boots. I have entered several contest to try to win a pair but, so far haven't. Maybe this will be the time. These look like they would be great especially in the cold weather. What a great looking pair of Lugz! I have a pair so I know how great they are in the winter. Water resistant, and they have a great tread on the bottom for when walking on ice and snow. These would be super for my brother! 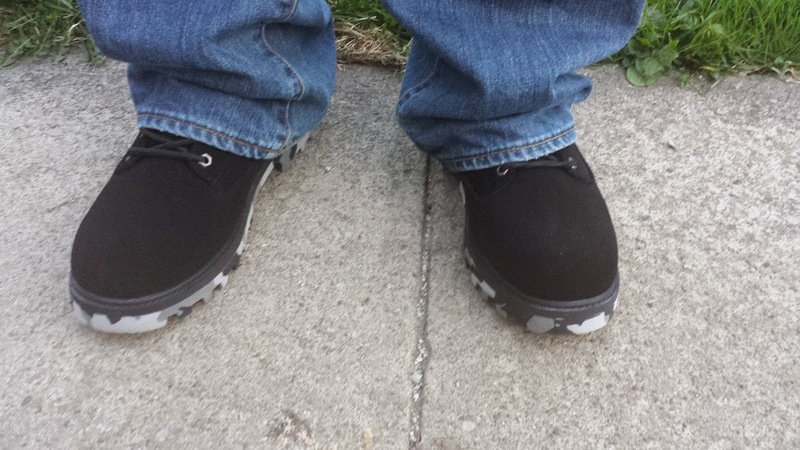 I love Lugz they are so comfy and have great styles!! My hub would love these! Interesting and thorough review, nice to hear that these Lugz boots wear well and hold up and that the water has not affected their looks, good to know that your boys really ware these shoes and work in them, thank you for sharing this review. I love these! Perfect for my brother for Father's Day (our Dad has passed), and I love the good tread on the bottom because it gets so slippery on the ice here in the winter! My son would absolutely love these, he is a big fan of Lugz and has been wearing them for a long time now. He loves to see the new styles come out and this style looks like one he would like. My son really needs new boots! These boots sound like exactly what he needs. My son would absolutely love these, he is a big fan of Lugz and has been wearing them for years now. He loves to see the new styles come out and this style looks like one he would like. Thank you. Nice and warm, water resistant, with a good anti-slipping tread, and they look GREAT! What's not to love? Perfect for my brother! Thanks for the chance to win! I had not realized that so many stars and athletes have endorsed Lugz!! They must be really great!! My son would totally love these, he is a big fan of Lugz and has been wearing them for a long time now. He loves to see the new styles come out and this style looks like one he would like. Thank you. We love LUGZ! They are comfortable, good looking, water resistant, and the tread on the bottom is perfect for icy sidewalks in the winter. LUGZ rocks! I love these boots! They would look so good on my hubby. My dad works in construction, so he needs tough boots! These would be great for him. These would be great for my dad! He works in construction, so he needs tough boots. These are perfect for my brother! He is not that steady on his feet, and the great tread on the bottom would help so much when it's icy in the winter! My son would totally love these, he is a big fan of Lugz and has been wearing them for a long time now. He loves to see the new styles come out and this style looks like one he would like. Thank you so much. These are really nice looking boots! My hubby would look great in them! We are huge fans of Lugz in our household too. In fact, I have my Lugz rain boots on right now! My son would love these. He has had a few pair and they seem to stand up to how hard he is on shoes. I like these boots. They look comfortable and appropriate for men. A good pair of shoes makes working outside or inside more comfortable. So perfect for my brother! He is disabled and not too steady on his feet, so that great tread would keep him from falling. Plus they look great! My son would really like these, he is a big fan of Lugz and has been wearing them for a long time now. He loves to see the new styles come out and this style looks like one he would like. Thank you so much. These would perfect for my brother. He is the only man in my life (I am widowed and our father has passed). Perfect for brother because of the good tread, he gets a little unsteady sometimes. My son would absolutelyappreciate these, he is a big fan of Lugz and has been wearing them for a long time now. He loves to see the new styles come out and this style looks like one he would like. LUGZ are the best! I have a pair, and I'd love to get this grat looking pair for my brother. He needs the super tread on the bottom. Plus, they he'd look so nice in them! I have a pair of Lugz that I love. I have had them for several years and they still look great. My pair does not have memory foam, but that sounds great. I guess I will have to get another pair. This is the coolest style of Lugz I've seen and I've seen a lot. I wear boots 90% of the time. I'll be going from one task to another and a pair of boots let me do that. My son would absolutely appreciate these boots, he is a big fan of Lugz and has been wearing them for a long time now. He loves to see the new styles come out and this style looks like one he would like. These would be so nice for my brother. He really doesn't have anuthing as stylish as these. I have a pair of LUGZ and I love them. Plus, he could use the great tread on the bottom, as he is a little unsteady on his feet. My son would absolutely appreciate these boots, he is a big fan of Lugz and has been wearing them for several years now. He loves to see the new styles come out and this style looks like one he would like. My brother would love these! They are so sharp looking, plus the tread is great. He is unsteady on his feet, and that tread would help. I have a pair of LUGZ and they rock! My son would absolutely appreciate these boots, he is a big fan of Lugz and has been wearing them for several years now. He loves to see the new styles when they come out and this style looks like one he would like. So perfect for my brother! Stylish, and with a great tread on the bottom! (He's not too steady on his feet). Plus, LUGZ quality is well-known. I have several pairs! I know that my son would absolutely appreciate these boots, he is a big fan of Lugz and has been wearing them for several years now. He loves to see the new styles when they come out and this style looks like one he would like. I love LUGZ. They are comfortable, they last forever, and they look great! Also, they have this really good tread on the bottom - so important when the ground is slippery! I'd love to get these for my brother! I really like these boots in the gray color. They look like really nice boots and I think they look I would get a lot of use out of them. These Lugz boots are so stylish and durable looking. My husband would love these. I really love Lugz shoes. I would love to win for my husband because his boots are talking as of right now lol. He works all day long and it wears his boots out fast so it would be fun to surprise him with a new pair. I would also like to win, but I'm thinking of him first. I know my son would absolutely appreciate these boots, he is a big fan of Lugz and has been wearing them for several years now. He loves to see the new styles when they come out and this style looks like one he would like. Thank you. I love the Lugz brand. I would gift these to my son and he would love them. They are very good looking boots. Thanks for the chance. I really like the look of these. I like that they are rugged yet can be worn to go out. I'm sure my son would appreciate these boots, he is a big fan of Lugz and has been wearing them for several years now. He loves to see the new styles when they come out and this style looks like one he would like. Thank you. These boots would be great to have. They look like they are light enough to wear for awhile without weighing you down and also have a great tread pattern to really grip what yo are walking on. Lugz brand has such great styles. I love that their quality construction, durability and comfort. These are really nice boots. My boyfriend has a pair of Lugz that he loves. I know he would love these too!